Congrats to Birgit, the Featured Stamper today at SCS!Â What a wonderful gallery she has. Lots of inspiration, but I finally picked one way back on page 9,Â Peace. 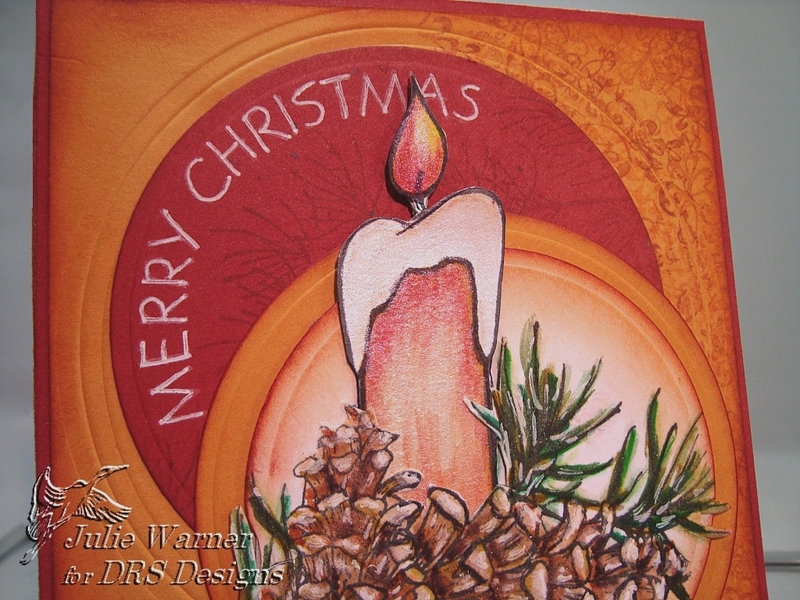 I liked the candle, the layout and the warm colors, so I kept those. I changed the images, left off the embossing and used twinkling H2O’s to add a little sparkle to my centerpiece. All images are DRS Designs. 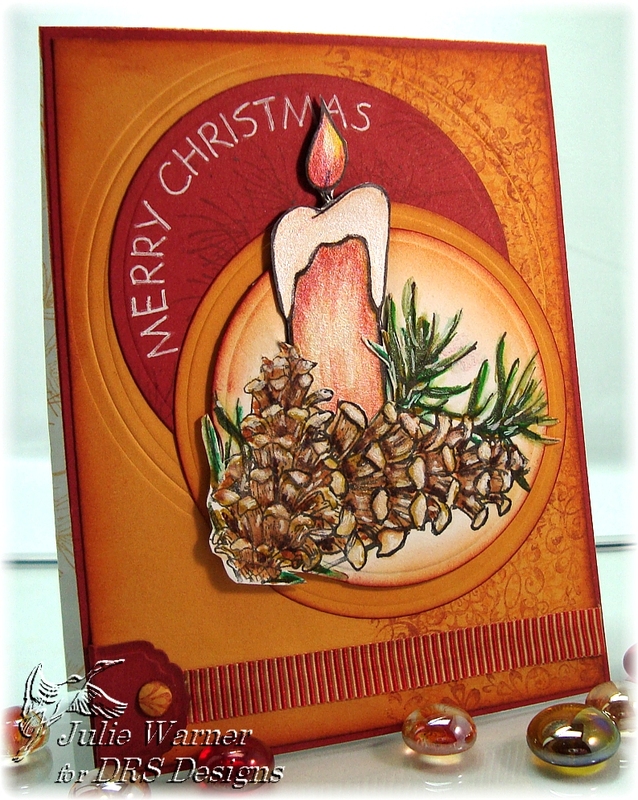 I stamped the candle and the pinecone square (didn’t ink the square part, just the pine cone) and the candle on separate pieces of white c/s, colored them w/ markers then added some Twinkling H2O’s on top. I used the Out of the Box Nestie Tech to cut out the pine cone. The edges were sponged thenÂ I cut around the top part of the pine cone and inserted the cut out candle.Â It’s attached to a larger mustard circle. I stamped the greeting using alabaster chalk ink around the edge of a dk red confetti circle and the pine bough image w/ redwood ink. I embossed a larger Nestie circle offcenter on a piece of mustard c/s. I sponged the edges and stamped a filigree snowflake repeatedly w/ the different ink colors. I didn’t have the right color ribbon, so took this red/white ribbed ribbon and colored it w/ a dk ochre marker. I used a small Labels 4 shape folded in half for the tab and punched a faux brad to add on top.